Just hours before Brandon Harris is supposed to head home to Cincinnati for a Labor Day family picnic, his boss at the Rock & Roll Hall of Fame forces him into giving a private tour to bratty British pop-rock star Lucas Black. Before he knows it, he finds himself swept up in a whirlwind road trip through Ohio with Lucas riding shotgun. Lucas grabs hold of this wild opportunity to run away—even for a few precious days—from the gilded cage that is his carefully managed life. He's just looking for a little fun and freedom as a normal person. From roller coasters to a college football game, Brandon begins to see the real Lucas Black buried under the famous persona. But by the time he and Lucas discover their mutual attraction, they only have one night left before both of them have to go back to their real lives. The fun is over... unless Lucas can run away for real this time and keep their adventure going. I adored this short story! I've never read anything by CJ Anthony before, but I'm putting them on my "watch for this author" list. Lucas Black is the hot pop star of the year. He's coined as the British Justin Bieber and he's on a mega stadium tour stopping in Ohio. Brandon Harris is an administrative assistant at the Rock & Roll Hall of Fame. It just so happens that Lucas Black wants a tour of the Hall while on Brandon's shift. Brandon's boss thinks he's the best man for the job being they are around the same age group. Brandon is not sure he's up for the task as he is more of a "classic rock dude" than a pop music fan, but hey, it's part of the job. In walks Black in all his pop star glory with his Ray Bans and lean body, tight pants, and that chin-length hair, and Brandon can’t help but admire the package. Surprisingly, the two hit it off and Brandon realizes there's more to Lucas than the bratty pop star. Lucas is being controlled by his father and manager and record studio, and he just wants to let loose a bit. Lucas convinces Brandon to give him the ultimate Ohio tour while running away from the demands of his career and father. I loved the Ohio references throughout the book (I'm from Michigan) and the fun road trip vibe of the story. The two have some definite sparks between them and it all comes to a head after an evening of drinking and jealousy. The pages flew by and the story unfolds in perfect timing. Thoroughly enjoyed! C.J. ANTHONY grew up watching soap operas and reading piles of books. She attributes her love of reading and romance to her mother, who not only taught her to read but also made countless trips to the library lugging those piles of books home for her to read. It wasn’t a far jump to start writing her own stories, early childhood tales about flower families and traveling to the moon with her best friend. C.J.’s favorite stories to read and write include “opposites attract” pairings—couples who might appear to be an odd couple to the rest of the world, but to each other fit together perfectly, finding their own happy ever after with a little hard work and a whole lot of love. Not surprisingly, C.J. is a big lover of rom coms—she’ll gladly take Julia Roberts standing in front of Hugh Grant asking him to love her over car crashes and shoot-em-up movies any day. She also watches way too much TV and every singing reality show there is. She loves music and musicians of all genres and attending live concerts. She spends most of her time juggling a day job and a commute and freelance design work on the side and falling asleep on her couch, dreaming of a day when she can work all day in her pajamas while living in a house by the beach. 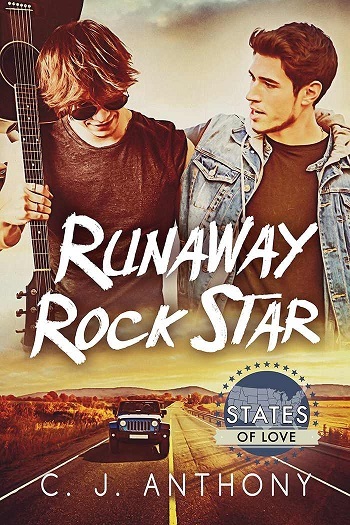 Reviewers on the Wicked Reads Review Team were provided a free copy of Runaway Rock Star (States of Love) by C.J. Anthony to read and review.